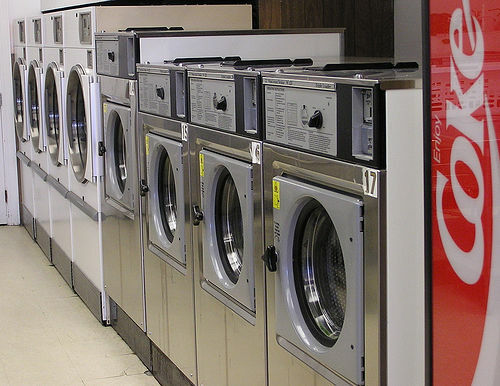 Service Costs > How Much Does a Laundromat Cost? Those who do not have the resources to wash and dry their clothes at home will often have to turn to a local coin-operated laundromat. Most of these machines will be able to take quarters, but there are now machines that are capable of taking debit or credit cards as well. How much does a coin-operated laundromat cost per load? On average, the price of a laundromat will depend on the washing machine size, the center, and your geographical location. On average, plan on spending around $1.50 to as much as $9 per load. Depending on the laundromat, most will have two to three different washer and dryer sizes, and the larger the load is, the more you are going to have to spend. As for the dryer, it will usually cost around $0.50 to $1.50 per 15 to 30 minutes of drying time, again, depending on the factors mentioned. On this forum thread on Arstechnica.com, forum members discussed the prices of a coin laundry. According to the responses, most said you should be prepared to spend $1 to $2 per load and about $0.50 per 15 minutes for the dryer. This BabyCenter.com forum thread talked about the costs as well, with the average load costing $1 to $2 per load. According to an article on TheSimpleDollar.com, they claimed the average laundromat charged $1.50 per washer load and the same for a dryer load. Most people report, from various forums online, that they needed to do an average of 3 loads of laundry per week, per person. If each load takes $3 to wash and dry, then it’s safe to say the laundromat will cost around $10 per week. In order to do laundry, of course, you will need other items such as laundry detergent, dryer sheets and fabric softener. In order to get your laundry to and from the laundromat, you will need laundry bags or baskets to carry your clothes as well. You should also bring hangers with you to the laundromat as this can eliminate the need to spend time ironing when you get home. If you have to buy these necessary laundry items, such as detergent and dryer sheets, at the laundromat, some centers will have smaller versions designed for one load. Most of the time, these items will cost $1 to $2 and will be inside of a vending machine. Some centers will wash the laundry for you if you do not have the time. If they offer this service, they will often charge by the pound, ranging from $1 to $3 per pound. The same can be said about dry cleaning as many local coin laundromats offer dry cleaning services as well. As stated above, laundromat centers will have washing machines with certain load capacities, and these machines will charge based on the usage, not the loads. Average load capacities range from 20 to 80 pounds. So it does not matter if you put one shirt or fifty shirts in the machine, it is going to charge the same as long as the load fits. If you are thinking about buying a washer and dryer, experts claim that it can take up to two years to recoup the costs. If you plan on staying at your current location for more than two years, it may be wise to invest in a washer and dryer setup rather than going to the laundromat every week. To save yourself time and hassle, get everything you need to do your laundry ready before you go to the laundromat. This includes making sure that the clothing is sorted into loads, having a roll of quarters ready, and having the necessary amount of detergent packed so you do not have to take an entire container with you. Do not forget to bring your own detergents and dryer sheets. The costs in the laundry centers are often three to four times more than what you will pay at a local retailer. If you are tight on a budget, consider going to a local dollar store to buy a no-name detergent. It will always cost more to do your laundry at a local laundromat than doing it at home. In fact, according to the Simple Dollar study link mentioned prior, the costs at a local laundromat is $3.12, whereas the average load at home is $0.97. The only time you should consider these centers is if your current setup is broken or you do not have access to machines while on vacation or out of town. If you are a frequent customer, many centers offer frequent customer cards. The more you go, the more you can potentially save. While rare, keep your eyes peeled for special coupons or promotions. For example, we were able to find a laundromat that offered special pricing on Tuesday mornings, one of the slower days in the week. Some laundromats offer a card system, where you can load a pre-loaded amount onto the card. If the laundromat were to use a system such as this, some do offer discounts if you add a certain amount to the card at once.